How to Save Cost for 500Gbps Metro Network Over Long Distance? Increasing bandwidth has always been the most important task of telecom engineers. Through decades of research and engineering effort, 40Gbps and 100Gbps solutions have been used for network applications. But 40G and 100G transceivers can’t support too much long distance (QSFP-40G-ER4 for 40 km, QSFP-100G-LR4 for 10 km). How to extend the 500Gbps link to thousands of kilometres in Metro network within limited budget? Fibre cable cost takes a certain percentage in the whole network budget. Point to point connection needs many cables, while WDM technology take well care of this issue. 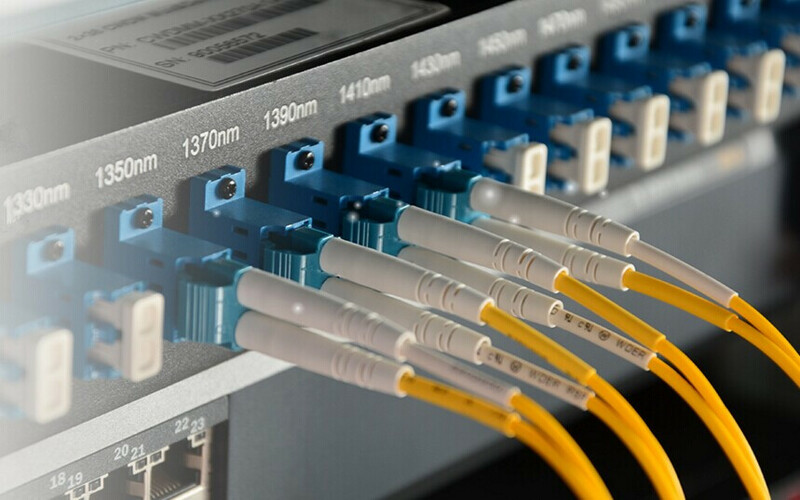 In a metro network, usually multiple 10Gbps signals are transmitted by the use of DWDM Mux/Demux over a single fibre cable, which can save lots of money on multiple fibre cables and cable management issues. Then how to save cost to transmit 500Gbps signals over single fibre cable? It sounds unbelievable. But we have the cost-effective solution. As we know, it will cost too much to replace all the current network system for upgrading to higher data rate. To save cost for increasing bandwidth, some producers add an extra port on DWDM Mux/Demux and that is 1310nm or 1550nm port. This port supports 1310nm or 1550nm transceiver. With such port, you can add 1G/10G/40G/100G to the existing DWDM network. 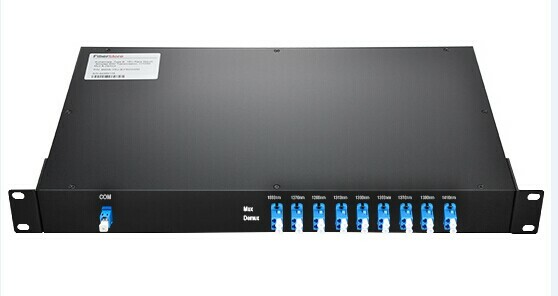 For instance, we use 40-channel C21-C60 dual fibre DWDM Mux/Demux with 1310nm port and 1310nm band port for 1G/10G/40G/100G “grey” light. 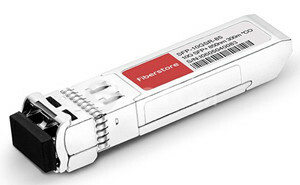 Plug 10G DWDM SFP+ transceivers into 40 channels, the overload is 400Gbps. Once plugging a 1310 40G QSFP+ LR4/ER4, then the total link reach up to 440G (400G + 40G). If install a 100G QSFP28 LR4 transceiver into 1310 port, the whole transport will be 500Gbps (400G + 100G). See this solution realize the goal of saving cost to run such huge network load over a single fibre. Since 500G signals can be transmitted over a single fibre cable, we have another issue to be solved. 500G transmission distance is needed far more than few kilometres in real life, maybe thousand of kilometres. How to extend the transmission distance? According to IEEE standard, LR4 and ER4 transceivers can support the reach of 10 km and 40 km in the in ideal conditions, not considering fibre loss or connector loss. To extend 500Gpbs transmission distance, we need SOA (Semiconductor Optical Amplifier) and EDFA (Erbium Doped Fibre Amplifier). Add an SOA to support 40G/100GBASE-LR4 transceiver (over 1310 nm). The SOA is used to amplify incoming (Rx) signal on the receiving side of the link. So that the distances can reach up to 60 km. In 10Gbps DWDM networks, the signal transmission distance can be extended to hundreds of kilometres by the use of and EDFA (Erbium Doped Fibre Amplifier). DWDM technology is very necessary to extend Metro Network reach. In this 500Gpbs Metro network, I have introduced very detailed cost-effective solutions. Remember all the indispensable DWDM equipment such as DWDM transceivers, DWDM Mux/Demux, EDFA, etc. For more information, please visit the site about FS.COM Long Haul DWDM Network Solution. This entry was posted in WDM System and tagged 500Gbps, DWDM MUX/DEMUX, DWDM transceiver, EDFA on May 18, 2017 by laura. Coarse Wavelength Division Multiplexing (CWDM) is one of WDM technologies. It uses up to 20 different wavelengths for data transmission over a single fibre. CWDM applies coarse wavelength grid and it allows low-cost, uncooled lasers, which makes CWDM systems less expensive and consuming less power. There are many optical equipment applying CWDM technology. This article will introduce CWDM transceiver. CWDM transceiver is a kind of optical modules employing CWDM technology. CWDM transceiver enables connectivity between existing network equipment and CWDM Multiplexers/DeMultiplexers (Mux/DeMux). When used with CWDM Mux/DeMux, CWDM transceiver can increase network capacity by transmitting multiple data channels with separate optical wavelengths (1270 nm to 1610 nm) over the same single fibre. CWDM transceivers are also useful for reducing network equipment inventories by eliminating the need to maintain surplus units/ devices of various fibre types for network repairs or upgrades. CWDM transceiver includes four types, such as CWDM SFP, CWDM SFP+, CWDM XFP and CWDM X2. The following shows more details about these CWDM transceiver modules. CWDM SFPs are hot-pluggable transceiver modules. CWDM SFP transceivers are SFP MSA (Multi Sourcing Agreement) and IEEE 802.3 & ROHS compliant. CWDM SFPs can provide data rates including 1G, 2G and 4G over the link distance of up to 200 km by connecting with duplex LC single-mode patch cords. CWDM SFPs transmit multiple data channels by combining separate optical wavelengths onto a single fibre to increase network capacity. CWDM SFPs can be used to support the CWDM passive optical system combing CWDM OADM (optical add/drop multiplexer). When CWDM SFPs used with transponders and media converters, these two optical components offer convenient method to convert existing legacy equipment with standard wavelengths or copper ports to CWDM wavelengths. CWDM SFP+ offers service providers and enterprise companies an easy way to get a scalable 10 Gigabit Ethernet network. It is a cost-effective solution for 10 Gigabit Ethernet applications in campus, data centre and metropolitan area access networks. CWDM SFP+ can transport up to eight channels of 10 Gigabit Ethernet over single-mode fibre strands at the wavelengths including 1610 nm, 1590 nm, 1570 nm, 1550 nm, 1530 nm, 1510 nm, 1490 nm, and 1470 nm. CWDM SFP+ solution is helpful to increase the bandwidth of an existing 10 Gigabit Ethernet optical infrastructure without adding new fibre strands. The solution can be used in parallel with other SFP+ devices on the same platform. CWDM XFP is a hot-pluggable module designed in Z-direction and mainly used for typical routers and switch line card applications. CWDM XFP transceivers are designed for Storage, IP network and LAN. They comply with CWDM XFP MSA. CWDM XFPs cover the wavelengths from 1270 nm to 1610 nm. These modules can support the distance up to 100 km, which depends on the wavelengths, fibre types and the CWDM Mux/DeMux insertion loss. CWDM X2 transceiver is designed for CWDM optical data communications such as 10G Ethernet and 10G Fibre Channel applications. CWDM X2 wavelengths are available from 1270 nm to 1610 nm. CWDM X2 is MSA Compliant. It supports the transmission distance up to 80 km connecting with duplex SC single-mode fibrecable. CWDM technology provides a low-cost solution which allows scalable and easy-to-deploy Gigabit Ethernet and Fibre Channel services. CWDM transceiver enables a more flexible and highly available multi-service network with the combinations of CWDM OADMs and CWDM Mux/DeMux. FS.COM offers all kinds of CWDM transceiver like CWDM SFP, CWDM SFP+, CWDM XFP, CWDM X2. Our CWDM transceivers are compatible with most famous brands and all these optics have been fully tested to make sure high compatibility. For more details about FS.COM CWDM transceiver and other CWDM equipment, please visit our site www.fs.com or contact us via sales@fs.com. This entry was posted in WDM System and tagged CWDM SFP, CWDM transceiver, CWDM X2, CWDM XFP, optical transceiver on November 29, 2016 by laura. In recent years, the telecommunications backbone has experienced huge growth. The tremendous growth of Internet traffic has far surpassed the network capacity. The “last mile” still remains the bottle neck between high-capacity local area networks and the backbone network. So a new technology for optical access network, which is simple, scalable but not expensive, is needed. And that is Ethernet passive optical network (EPON). EPON, unlike other PON technologies which are based on the ATM standard, is based on the Ethernet standard. This lets you utilise the economies-of-scale of Ethernet, and provides simple, easy-to-manage connectivity to Ethernet-based, IP equipment, both at the customer premises and at the central office. As with other Gigabit Ethernet media, it is well-suited to carry packetized traffic, which is dominant at the access layer, as well as time-sensitive voice and video traffic. 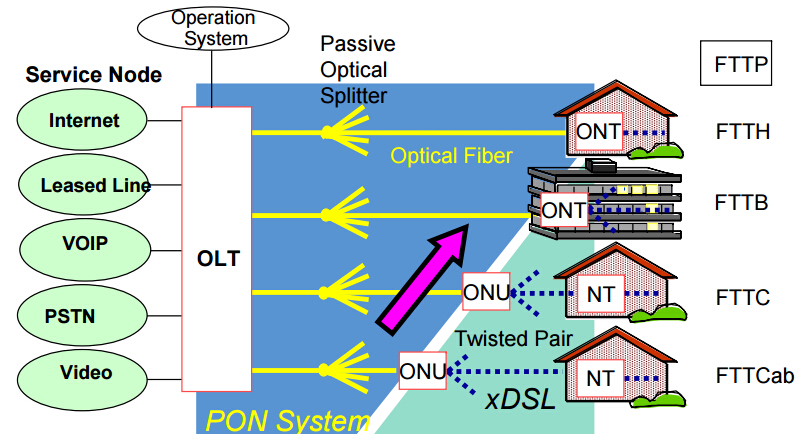 An EPON network includes two parts: an optical line terminal (OLT) and an optical network unit (ONU). The OLT resides in the central office (CO). This could typically be an Ethernet switch or Media Converter platform. OLT is mainly designed for controlling the information float across the optical distribution network (ODN). OLT has two float directions: upstream (getting an distributing different type of data and voice traffic from users) and downstream (getting data, voice and video traffic from metro network or from a long-haul network and sending it to all ONU modules on the ODN. The ONU resides at or near the customer premise, in a building, or on the curb outside. It uses optical fibre for connecting to the PON on the one side, while interfacing with customers on the other side. In an EPON, the process of transmitting data downstream from the OLT to multiple ONU is fundamentally different from transmitting data upstream from multiple ONUs to the OLT. In the downstream direction (from network to user), Ethernet frames transmitted by OLT pass through a 1:N (N represents the number of subscribers each fibre can serve) passive splitter and reach each ONU. Splitting ratios are usually between 4 and 64. 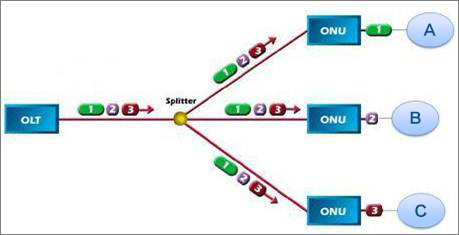 At the splitter, the traffic is divided into separate signals, each carrying all of the ONU–specific packets. When the data reaches the ONU, it accepts the packets that are intended for it and discards the packets that are intended for other ONUs. In the upstream direction (from user to network ), due to the directional properties of a passive combiner (optical splitter), data frames from any ONU will only reach the OLT, not other ONUs. Frames in EPON from different ONUs transmitted simultaneously may collide. Thus, ONUs need to share the trunk fibre channel capacity and resources. First, EPON uses a point-to-multipoint topology instead of point–to-point in the outside plant. Thus it saves much of the cost of running fibre from every customer to the CO, installing active electronics at both ends of each fibre and managing all of the fibre connections at the CO. And EPON also eliminates active electronic components, such as regenerators and amplifiers, and replaces them with passive optical couplers that are less-expensive, simpler, and longer lived than active ones. As to the cost of expensive electronic components and lasers in the OLT, it will be shared over many subscribers not paid by each subscriber. Second, EPON offers high bandwidth to subscriber. The traffic rates of 1Gbps in downstream and return traffic of 800 Mbps have been achieved already. Compared with point–to-point technology, EPON is specially made to address the unique demands of the access work. So more bandwidth can be got by each subscriber. At last, the main advantage of EPON is that it can eliminate complex and expensive asynchronous transfer mode (ATM) and SONET elements and simplify the networks dramatically. Traditional telecom networks use a complex and multilayered architecture. While this architecture requires a router network to carry IP traffic, ATM switches to create virtual circuits, add/drop multiplexers (ADM) and digital cross-connects to manage SONET rings, and point-to-point DWDM optical links. EPON is suitable for Fibre-to-the-Home/Building/Business applications, including voice, data and video services. EPON is a shared network but with much higher bandwidth. It’s a highly attractive access solution for service providers to extend fibre into the last mile because of low cost and good performance, resulting from their nature as passive networks, point-to-multipoint architecture, and native Ethernet protocol. This entry was posted in WDM System and tagged EPON, OLT, ONU on December 15, 2015 by laura. 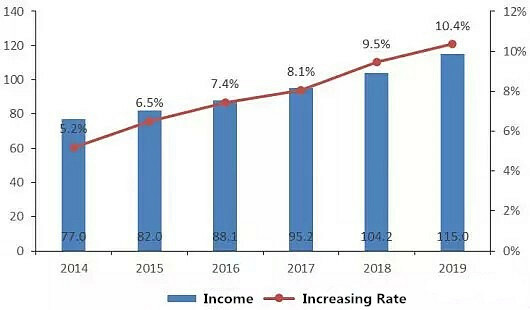 The capacity of fibre optical communication systems has undergone enormous growth during the last few years in response to huge capacity demand for data transmission. With the available wavelength division multiplexing (WDM) equipment, commercial system can transport more than 100 channels over a single fibre. However, increasing the number of channels in such systems will eventually result in the usage of optical signal demultiplexing components with greater values of optical attenuation. Besides, when transmitted over long distances, the optical signal is highly attenuated. Therefore, to restore the optical power budget, it is necessary to implement optical signal amplification. This article may mainly tell you why EDFA is used in WDM system and how does it work. EDFA stands for erbium-doped fibre amplifiers, which is an optical amplifier that uses a doped optical fibre as a gain medium to amplify an optical signal. EDFA has large gain bandwidth, which is typically tens of nanometres and thus actually it is enough to amplify data channels with the highest data rates. A single EDFA may be used for simultaneously amplifying many data channels at different wavelengths within the gain region. Before such fibre amplifiers were available, there was no practical method for amplifying all channels between long fibre spans of a fibre-optic link. There are practically two wavelength widows C-Band (1530nm-1560nm) and L-Band (1560nm-1600nm). EDFA can amplify a wide wavelength range (1500nm-1600nm) simultaneously, which just satisfies the DWDM application, hence it is very useful in WDM for amplification. The basic configuration for incorporating the EDFA in an optical fibre link is shown in the picture below. The signals and pump are combined through a WDM coupler and launched into an erbium-doped fibre (EDF). The amplified output signals can be transmitted through 60-100km before further amplification is required. Erbium-doped fibre is the core technology of EDFA, which is a conventional silica fibre doped with erbium ions as the gain medium. Erbium ions (Er3+) are having the optical fluorescent properties that are suitable for the optical amplification. 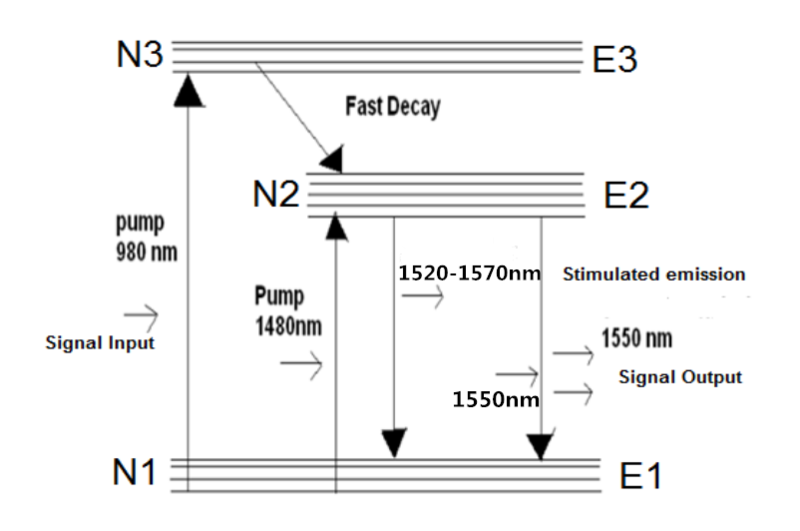 When an optical signal such as 1550nm wavelength signal enters the EDFA from input, the signal is combined with a 980nm or 1480nm pump laser through a wavelength division multiplexer device. The input signal and pump laser signal pass through erbium-doped fibre. Here the 1550nm signal is amplified through interaction with doped erbium ions. This can be well understood by the energy level diagram of Er3+ ions given in the following figure. To ensure the required level of amplification over the frequency band used for transmission, it is highly important to choose the optimal configuration of the EDFAs. Before you buy a EDFA, keep in mind that the flatness and the level of the obtained amplification, and the amount of EDFA produced noise are highly dependent on each of the many parametres of the amplifier. FS provide many kinds of EDFAs, especially the DWDM EDFAs (shown in the picture below), which have many output options (12dBm-35dBm). Besides, they are very professional in optical amplifiers. Whatever doubts you have, they can give a clear reply. This entry was posted in WDM System and tagged EDF, EDFA, Erbium Doped Fibre Amplifier, erbium-doped fibre, Optical Amplifier, wavelength division multiplexing, WDM on September 3, 2015 by Admin. Wavelength-division multiplexing (WDM) is a technology which allows multiple signals to be transmitted at different wavelengths over a single optical transmission medium. It can dramatically expand the total capacity of an optical network, for many signals are able to be transported simultaneously. This core technology makes optical network capacity to be gradually efficiently increased to meet the higher demand for bandwidth. To construct WDM networks, a wide range of optical components optimised for WDM applications are required to be researched and created. One of the important components is WDM multiplexer. WDM multiplexer is an electronic device that uses WDM technology. It is able to combine light signals with different wavelengths coming from different fibrs on toe a single fibre. A multiplexer usually has two signal inputs, one control input and one output. The input end of a WDM multiplexer is coupler that combines all the inputs into one putout fibre. And each channel in a WDM multiplexer is designed to transmit a specific optical wavelength. For example, an 16-channel multiplexer would have the ability to combine sixteen different channels or wavelengths from separate optical fibres onto one optical fibre. And the separated signals will be recovered by another multiplexer called demultiplexer. The following picture shows how the signals are transported. WDM multiplexer is available with various configurations such as 2,4, 8, 16, 32, 64, etc. The types of multiplexers can be divided by channel spacing. They can be called CWDM multiplexers, wideband or crossband ones, and DWDM multiplexers, narrowband or dense ones. Compared to DWDM multiplexers, CWDM multiplexers combines signals at fewer channels for its larger channel spacing. CWDM multiplexers is usually with configurations such as 8, 16 and so on, while DWDM multiplexers is commonly with configurations including 32, 96, 128, etc. 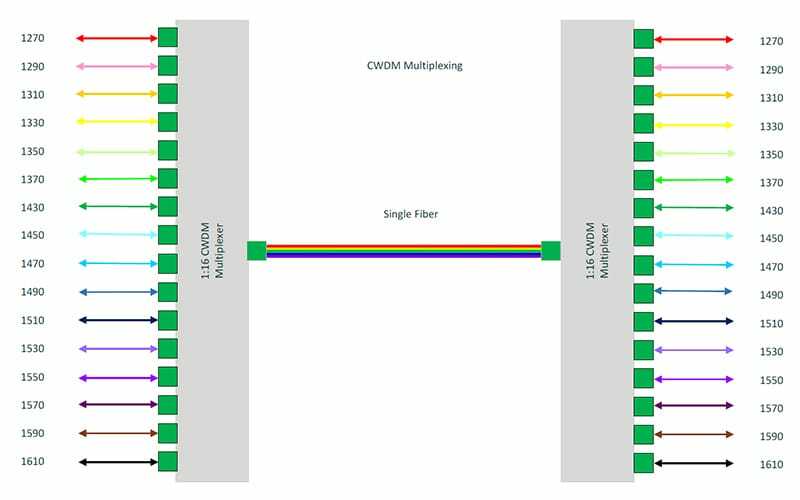 CWDM multiplexers are able to combine a broad range of wavelengths such as l310 nm and 1550 nm. DWDM multiplexers are able to combines wavelengths with 100 GHz channel spacing. It typically provides a broad range of wavelengths in 1.55-μm region within C-band. WDM multiplexer, an advanced optical component, is widely used in optical links. It can increase connectivity and bandwidth of processing systems by interconnecting different channels. Most WDM multiplexers employ one of three technologies: arrayed waveguide grating (AWG), filter and dispersive element, primarily diffraction grating. Some multiplexers based on filters exhibit high insertion loss for devices with many channels, which makes them are not suitable in the application of multimode and bi-directional transmission. But the multiplexers with AWG technology offers many advantages over them including low cost for many channels, low loss, little crosstalk, and receiving much attention. With AWG technology, WDM multiplexer is ideal for the application of high throughput optical links in parallel processing and computing. It is concluded that WDM multiplexer with WDM technology is a key component in optical links and even in the high throughput optical links. This entry was posted in WDM System and tagged CWDM multiplexer, DWDM multiplexer, WDM, WDM multiplexer on August 1, 2015 by Admin. Due to the advantages of fibre optical transmission over electrical transmission, optical fibres have been researched extensively. Among those researches, one of the fields of optical fibres is designing a sensing system based on optical fibres and optical sensors. And as optical fibres are being deployed in an increasing number with lowering cost, fibre optic sensors (FOSs) replaced ordinary ones and keep growing. It is also expected that optical sensors will have a broad prospect. In this article, the fundamentals of fibre optic sensors will be reviewed, along with the basic introduction, types, applications and prospect. Fibre optic sensor is a sensor that uses optical fibre either as the sensing element or as a means of relaying signals from a remote sensor to the electronics that process the signals. It consists of optical source (LASER, laser diode, LED, etc), optical fibre as transmission channel, sensing element, optical detector and end processed devices (oscilloscope, optical spectrum analyzer, etc). Compared to conventional electronics sensors, it has numerous advantages such as compact size, light weight, immunity to electromagnetic interface, high performance and larger bandwidth, etc. Fibre optic sensors can be classified by different standards including the sensing location, the operating principal and applications. By the first standard, they can be classified into intrinsic or extrinsic sensors. By the second standard, they can be divided into intensity, phase, frequency or polarization sensors. And by the last standard, they can be classified into physical, chemical, bio-chemical sensors. Here is a brief introduction of intrinsic and extrinsic sensors. 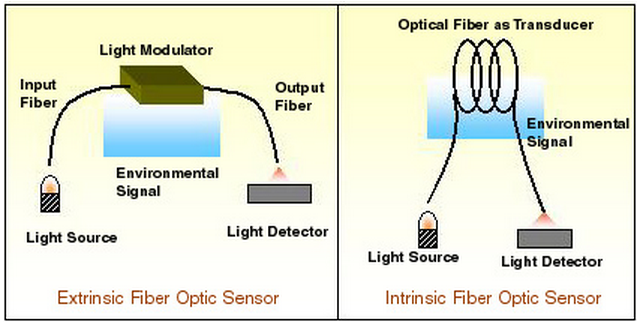 Intrinsic fibre optic sensor: it has a sensing region within the fibre and light never goes out of fibre. Extrinsic fibre optic sensor: the light in it has to leave the fibre and reach the sensing region outside and then comes back to the fibre. Fibre optic sensor market is potential in the future. It is 1.99billion in 2014 and expected to reach 3.15 billion by 2019, at a compound annual growth rate (CAGR) of 9.6%. According to the picture, the market is growing at an increasing rate, up from 5.2% to 10.4%. It will give rise to greater implementation of optical sensors in regular life for their transparent advantages over electronic sensors and various applications in physical, chemical and bio-chemical fields. China has dominated the fibre optic sensor market and plans to expand its market share at higher speed. For more information, please visit www.fs.com. This entry was posted in WDM System and tagged extrinsic fibre optic sensor, fibre optic sensor, intrinsic fibre optic sensor, optical sensor on July 18, 2015 by Admin. Optical communications are more and more prevailing for the high demand for telecommunication, video and data transmission. The optical fibre is capable of transmitting many signals over long distance to meet people’s various requirements. But the signals are easily attenuated in the long-distance high speed networks. Amplifiers are a key enabling technology for strengthening optical signals. Electrical amplifiers are originally used but gradually replaced by optical amplifiers. Optical amplifier is a device that can amplify optical signals directly without the need to convert them into electrical ones. Electrical amplifier is originally used but gradually replaced by optical amplifier. It is a much cheaper solution in comparison with electrical amplifier which has costly conversions from optical to electrical signal. The longer the transmission distance is, the more electrical signals need to be converted, which makes the cost of electrical amplification higher and higher. So optical amplifier is used in an increasing number. More detailed information about it is as followed. Optical amplifiers can be used as power boosters, in-line amplifiers and detector pre-amplifiers in fibre optical data links. Booster amplifiers are used to increase the optical output of optical transmitters when signals haven’t entered the optical fibres. Once transmitted, the optical signals are attenuated by 0.2dB/km. In-line amplifiers are then used to restore the optical signals to its original power level. At the end of the data link are pre-amplifiers which are used to increase the sensitivity of an optical receiver. There are three most important types of optical amplifiers including erbium-doped fibre amplifier(EDFA), semiconductor optical amplifier (SOA) and Raman amplifier. Here will introduce them briefly. Erbium-Doped fibre amplifier: it is an optical or IR repeater that amplifies a modulated laser beam directly without optical to electrical conversion. It uses a short length of optical fibre doped with the rare-earth element erbium. The signals-carrying laser beams are usually at IR wavelengths with application of external energy. It has low noise and capable of amplifying many wavelengths simultaneously, which is an excellent choice in optical communications. Semiconductor optical amplifier: it is an optical amplifier which uses a semiconductor to provide the gain medium. The gain medium is undoped InGaAsP. This material can be tailored to provide optical amplification at wavelengths near 1.3 µm or near 1.5 µm which are important wavelengths for optical communications. It makes fewer noises than EDFA and generates less handle power. But it is more suitable to be used in networks where the best performance is not required for it is less expensive. Raman amplifier: it is an optical amplifier based on Raman gain created by Raman scattering, which works entirely differently from EDFA or SOA. Raman optical amplifier have two key elements: the pump laser and the directional coupler. The pump laser has a wavelength of 90 nm to 1500 nm. The circulator provides a convenient means of injecting light backwards in to the transmission path with minimal optical loss. Raman amplification occurs throughout the length of transmission fibre, which makes Raman amplifier known as distributed amplifier. For more information about optical amplifier, please visit www.fs.com. This entry was posted in WDM System and tagged EDFA, optical amplifer, Raman amplifier, SOA on July 13, 2015 by Admin. Nowadays, there is a growing popularity of Video-on-Demand (VoD), VoIP and increased IPTV deployment. Providers aim to offering fibre-to-the-home (FTTH), (fibre-to-the-building) FTTB and fibre-to-the-curb (FTTC) solutions through advancing passive optical network (PON) technology. The term “PON” may confuse you for its complexity and extensiveness. Details are as followed. PON is a single, shared optical fibre that uses inexpensive optical splitters to divide the single fibre into separate strands. It can build up a point-to-point topology supporting 1Gbps transmission to home and business typically within 20km. PON system is called “passive” because that there are no active electronics within the access network. It uses optical splitters to separate and collect signals rather than electrically powered switching equipment. OLT: it is a device at the service provider’s central office, performing conversion between the electrical signals used by the service provider’s equipment and the fibre optic signals used by the passive optical network and coordinating the multiplexing between the conversion devices on the other end of that network. ODN: it is used for distributing signals to users in a telecommunications network by optical fibre. ODN has been made up entirely of passive optical components particularly singlemode optical fibres and optical splitters. GPON: it is defined by ITU-T recommendation series G.984.1 through G.984.6. It can transport not only Ethernet, but also ATM and TDM (PSTN, ISDN, E1 and E3) traffic. It supports services like carrying video and delivering video on single fibre distribution, allowing low-consuming transmission, more efficient maintenance, cabling and overall performance. EPON: it is defined by the Ethernet standard rather than by the ATM standard, making you utilise the economies-of-scale of Ethernet. It can provide simple and easy-to-manage connectivity to Ethernet-based, IP equipment both at the customer premises and at the central office. It is perfect for voice and video traffic solution as with other Gigabit Ethernet media. For more information about OLTs, Optical Splitters and ONUs, please visit FS.COM. This entry was posted in WDM System and tagged EPON, GPON, ODN, OLT, ONU, Optical Splitter, PON on June 27, 2015 by Admin.